Dance Commentary by Heather Desaulniers: "Nutcracker"
Last Friday, I made my second December excursion to San Francisco’s War Memorial Opera House. While less than two weeks since my first visit, the vibe was entirely different. The resplendent lobby had been decked to the nines and patrons were dressed in their most festive finery. 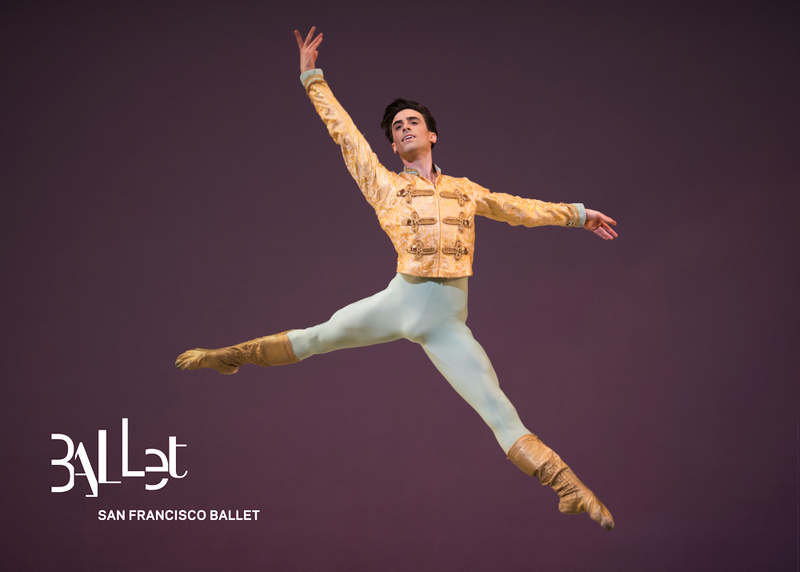 San Francisco Ballet had arrived in the space for its annual Nutcracker engagement, the classic two-act story ballet that follows the enchanting Christmas Eve journey of Clara, Uncle Drosselmeyer and the Nutcracker Prince. I’ve seen this particular version (created by SF Ballet Artistic Director and Principal Choreographer Helgi Tomasson) most years since its premiere in 2004, and have already commented on the narrative arc, design and choreography for particular sections. But that doesn’t mean after ten plus years that there’s nothing more to say about SFB’s Nutcracker, especially if you look at the performances by the artists of the company in the various roles. After the overture and prelude scenes, the company and students from the San Francisco Ballet School invite the audience to the ever-elegant Christmas Eve party at the Stahlbaum’s. The children delight in the decorations and in their gifts, especially Clara (Chloe Treanor) who receives a Nutcracker doll from her Uncle Drosselmeyer. All the celebrants are transfixed by Drosselmeyer’s (Val Caniparoli) otherworldly entertainment, including the three full-size figures that he brings to life. These three short solos are always a highlight of the act, and they were again this year. Lonnie Weeks had uber-flexibility as the jester/mirliton character, Julia Rowe tackled the doll’s relevé-heavy enchainment with ease and confidence and James Sofranko cycled through parallel sissones and fouettés with precision and specificity. The dream/fight sequence is never my favorite part of any Nutcracker, but Tomasson’s does have some nice moments: the reappearance of the dolls from the party scene, the King of the Mice (brilliantly characterized once again by corps member Alexander Reneff-Olson) and of course, the Nutcracker Prince becoming real. Once the battle is finally over, the best parts of the Act, maybe even of the whole ballet, unfold: the brief Clara/Nutcracker duet, in which Joseph Walsh was every bit the Prince - regal, debonair and gallant in every balance, turn and jump. And then the wintery forest scene, led by the Queen and King of the Snow, danced at this performance by Lauren Strongin and Wei Wang. As Strongin and Wang began their opening pas de deux, with its grand lifts and partnered turns (including a low attitude spin that awes), the snow was already in a steady descent. The women of the corps de ballet (which on Friday night also included some of the apprentices and senior trainees from the school) joined the scene for the delicate, yet technically challenging variation: quick jetés, emboîtés in sequence and posé arabesques. This was all accomplished while a Sierra Nevada Mountains-style storm whirled about, with so much snow that whenever the dancers were at the back of the stage, unfortunately, you could barely see them. It was the only downside to an otherwise idyllic experience. Then we were off to another destination entirely for Act II. Sometimes referred to as the ‘Land of the Sweets’, in Tomasson’s Nutcracker, it is the Crystal Palace, presided over by the graceful and stately Sugar Plum Fairy (Sofiane Sylve). And after some onstage storytelling, the Act II divertissements get underway. The Spanish pas de cinq (Wona Park, Lauren Parrott, Blake Kessler, Sofranko and Myles Thatcher) had some of the best unison I’ve ever seen in this variation. Similarly, the lengthy French trio, in which Kamryn Baldwin, Ludmila Bizalion and Elizabeth Mateer have to navigate their pointework while twirling hand-held ribbons, also had a standout sense of special awareness. As the lead in the Russian dance, Daniel Deivison-Oliveira wowed the audience with his successive split jumps in second. There was so much loft and punctuation; it looked like he was jumping on a trampoline. Sylve led the Waltzing Flowers with super high extensions and multiple turning sequences that had both speed and exactitude. And then came the grand pas de deux, its solos and coda, danced by Walsh and Maria Kochetkova. While the first duet features thrilling shoulder lifts and the coda, superb turning phrases by both dancers, Walsh really stole the show. His solo was marked by exceptional pirouettes and multiple tours and he completely astonished with his fouetté series in the coda, arms alternating between second and fifth.